The ILAE defined an epileptic encephalopathy as a condition in which "the epileptiform EEG abnormalities themselves are believed to contribute to a progressive disturbance in cerebral function." Because this concept is evolving, this listing is not definitive; other epilepsy syndromes, such as some cases of benign focal childhood epilepsy with centro-temporal spikes (benign rolandic epilepsy) and autism with epileptiform EEG abnormalities, may also fit under this rubric. These 2 conditions are not currently considered epileptic encephalopathies, but there is increasing evidence that epilepsy or epileptiform activity may contribute to encephalopathy in a subset of cases. "Epileptic encephalopathy" is the most commonly used phrase in the literature. Note that the term epileptic encephalopathy may refer to conditions with severe and frequent ictal EEG activity (actual seizures) as a more prominent component. In contrast, the term epileptiform encephalopathies describes those conditions in which the interictal epileptiform EEG abnormalities may be more prominent than the clinical seizures. Chatrian et al in their 1974 glossary of EEG terms defined the term epileptiform to describe distinct waves or complexes, distinguishable from the background activity, which resemble the waveforms recorded in a proportion of human subjects suffering from an epileptic disorder. Epileptiform patterns include spike and sharp wave discharges, either alone or accompanied by slow waves, occurring singly or in bursts lasting at most a few seconds (see image below). Epileptic and epileptiform encephalopathies. EEG showing an epileptiform beta frequency burst. In clinical practice, the ability to distinguish between epileptiform activity and an epileptic disorder may be challenging, as variability may be seen within each epilepsy syndrome and within a given child over time. However, in some cases, severe developmental regression may be seen in the context of few seizures but severe interictal epileptiform abnormalities, as in some cases of LKS). The quantity of epileptiform activity does not correlate well with seizure severity. However, observational and anecdotal evidence correlate the quantity of epileptiform activity with the degree of cognitive impairment. Additional well-designed studies are needed to sufficiently quantify and correlate interictal epileptiform activity with neuropsychological and developmental measures. Inherent in the notion of an epileptic encephalopathy is that limiting or suppressing EEG ictal and/or interictal activity may improve cognitive and behavioral outcome. Anecdotal and small series data support this concept; however, this remains controversial due to the lack of data from larger well-designed studies. At this time, it remains unclear how much of the dysfunction seen in these disorders is due to epileptiform EEG activity and how much is due to the underlying cause of the epilepsy syndrome. Consequently, a useful guideline is to "treat the patient, not the EEG." Data are insufficient to recommend treatment for the sole purpose of minimizing interictal epileptiform activity at this time, especially when the clinical symptoms of the epileptiform activity on the patient are unclear. For more information, see Epilepsy and Seizures and First Pediatric Seizure. Epilepsy is a chronic condition with spontaneous, recurrent seizures; a seizure is defined as a clinical event associated with a transient, hypersynchronous neuronal discharge. Epileptic denotes the presence of epilepsy. Epileptic seizure is a clinical event associated with a transient, hypersynchronous neuronal discharge and represents only the symptom of a potential underlying brain pathology, not the actual disease. Encephalopathy refers to a disturbance in brain functioning, particularly in intellectual activity or higher cortical functioning as used in this review. Epileptiform refers to spike waves, sharp waves, spike and wave activity, or other rhythmic waveforms that imply epilepsy or may be associated with epilepsy. However, epileptiform activity alone does not confirm a diagnosis of epilepsy. Epileptic or epileptiform encephalopathy is a category of severe epilepsy syndromes of infancy or early childhood, in which the epileptiform EEG abnormalities themselves are believed to contribute to a progressive disturbance in cerebral function. More precisely, the term epileptic encephalopathies may be used to refer to those syndromes characterized by very frequent seizures, where as epileptiform encephalopathies may be used to refer to those syndromes that generally occur later and where the EEG epileptiform activity is more prominent than clinical seizures. Although the term epileptic aphasia has been used for LKS, epileptic aphasia by its strict definition refers to an aphasia caused by an actual seizure or, in other words, an ictal aphasia. Epileptiform aphasia refers to a language disorder—expressive, receptive, or mixed— associated with epileptiform features on EEG. The terms congenital aphasia, developmental aphasia, or acquired aphasia are used with this to describe whether the condition is developmental or acquired. Acquired aphasia implies previously normal language development with subsequent regression. Note that regression might occur even in developmental language disorders or the congenital aphasias. The epileptic encephalopathies are a group of age-specific epilepsy syndromes of diverse etiologies that share the potential for causing significant cognitive impairment. The underlying mechanisms of these disorders are still poorly understood. The deficits seen in some epileptic encephalopathies appear to generally correlate with the location, frequency, and degree of spread of abnormal electrical activity, as in LKS and CSWS; however, further studies are required to better quantify and characterize the evolution of these deficits with the various potential contributing factors. This characterization is complicated by the fact that evaluating subtle cognitive impairments from the involvement of noneloquent cortex requires testing of performance. The duration of electrical dysfunction may in part determine the severity of the disorder. Impairment at the exact moment of an interictal discharge has been described and is termed transient cognitive impairment. [10, 11, 12, 13, 14, 15, 16] Although challenging to demonstrate, this phenomenon appears to be due to a temporary disruption of a cortical network involved in a particular function at the time of an interictal epileptiform discharge. More chronic and permanent impairment may be seen in more severe disorders, such as LGS. The more severe epileptic encephalopathies fall into this category. In epileptic or epileptiform encephalopathies, ictal and/or interictal epileptiform activity often becomes more frequent during sleep. When discharges are present in the awake state, this is termed sleep potentiation. If discharges are present only during sleep, this is termed sleep activation. What are the mechanisms involved in the generation of such significant, interictal, sleep activation? What are the mechanisms involved in the cognitive/developmental regression that accompanies these conditions? The causes of epileptic encephalopathy vary among the different syndromes. The etiology is often unknown. Metabolic disorders, including nonketotic hyperglycinemia, have been described in early myoclonic encephalopathy and should be pursued. Structural lesions are rare. No clear etiology is found in approximately 40% of cases. There is a broad range of potential causes, including cerebral malformations, infection, hemorrhage, hypoxic-ischemic injury, metabolic disorders, and genetic conditions (eg, Down syndrome). In most cases, there is no clear etiology or structural problems, suggesting genetic factors may be causative or contributory. A genetic cause is identifiable in approximately half of children, including Angelman syndrome and 4p- syndrome. Other reported causes include hypoxic-ischemic injury and cortical dysplasia. Most cases are idiopathic with normal neuroimaging. A genetic etiology has been hypothesized given it sometimes has an association with febrile seizures and GEFS+; however, no specific gene has been implicated. Most cases of Landau-Kleffner syndrome are idiopathic, with normal results on neuroimaging; however, volumetric MRI analysis has revealed decreased volume in bilateral superior temporal gyrus and planum temporale in studied cases. Symptomatic cases of LKS and CSWS are described and are likely more common in CSWS. Epilepsy may aggravate autistic symptoms and interfere with developmental progress, independent of autism in some children; however, it is unclear if it is causative. In some conditions (eg, tuberous sclerosis, LKS), children may have some autistic features, though they usually do not meet full criteria for autism over time. Each of these childhood epilepsy syndromes has its own characteristic age of onset. The prognosis is related to the underlying disorder. The severity of developmental impairment varies with the type of epilepsy. The prognosis is very poor. Most children either die or are severely neurologically impaired. All surviving children have global developmental delays. Some children may progress to West syndrome and Lennox-Gastaut syndrome. These 3 disorders are considered to be on a spectrum by some authors. Progression to hypsarrhythmia portends a poorer prognosis. Development remains unaffected only in a minority. Most children experience slowing, plateauing, or regression of their developmental trajectory. An extensive literature review revealed that 16% of patients had normal development and 47% had continued seizures at an average follow-up of 31 months. No specific AED has been shown to affect long-term developmental outcome. The developmental prognosis partially depends on the etiology. When classified by etiology, normal development was described in 51% of cryptogenic cases versus only 6% of symptomatic cases. Approximately 17% of cases evolved into Lennox-Gastaut syndrome. Developmental regression is common. Death has been reported in infancy and childhood in severe cases. Development is normal initially, followed by regression occurring by the second or third year of life and progressing to a significant mental retardation. Cognition is severely affected, and most patients have motor and coordination dysfunction. In a series of patients followed into adulthood, approximately half had an IQ below 50. Seizures continue into adulthood, and mortality increases from epilepsy-related causes. Affected children have a poor prognosis, experiencing developmental regression, and eventual severe mental retardation. The repeated episodes of myoclonic status may contribute to cognitive deterioration. A family history of epilepsy and recurrent episodes of status epilepticus may portend a worse prognosis. Epilepsy longer than 3 years’ duration and nocturnal tonic seizures, characteristic of Lennox-Gastaut syndrome, may also suggest a worse prognosis in some patients. The developmental outcome is poor. Symptomatic Lennox-Gastaut syndrome increases the risk of mental retardation, which is reported in up to 100% of symptomatic cases in long-term follow-up. Other factors increasing the risk of mental retardation include earlier age of onset and history of infantile spasms. Most patients continue having seizures. Early remission of epilepsy does not necessarily improve cognitive outcome. The prognosis is variable. The epilepsy and ESES pattern improve and may remit after several years, whereas most children are left with varying degrees of language and cognitive dysfunction. Neuropsychological assessments should be performed in order to gauge developmental progress and the effect of treatments over time. Most children are developmentally normal and do not exhibit any obvious problems. However, a subset of children does experience cognitive impairment. An abundance of literature on benign rolandic epilepsy (BRE) has described a variety of neuropsychological deficits, but with no uniform profile of impairment identifiable and variable study methodologies. Bilateral rolandic EEG discharges are associated with poorer cognitive function than unilateral discharges. Left hemisphere discharges have also been associated with verbal problems, while right hemisphere discharges have been associated with nonverbal difficulties. Unfortunately, few studies have attempted to correlate EEG abnormalities, including spike discharge frequency, with neuropsychological deficits. EEG findings that have been correlated with cognitive problems include a high awake or sleep spike index and intermittent EEG slowing. [19, 39, 40, 41, 42, 43] However, further investigations are needed to clarify these relationships and better define this aspect of this syndrome. Input from a neurologist, developmental pediatrician, psychologist, neuropsychologist, audiologist, or speech pathologist is needed to determine the proper educational program. Khan S, Al Baradie R. Epileptic encephalopathies: an overview. Epilepsy Res Treat. 2012. 2012:403592. [Medline]. [Full Text]. Kural Z, Ozer AF. Epileptic encephalopathies in adults and childhood. Epilepsy Res Treat. 2012. 2012:205131. [Medline]. [Full Text]. Engel J Jr. A proposed diagnostic scheme for people with epileptic seizures and with epilepsy: report of the ILAE Task Force on Classification and Terminology. Epilepsia. 2001 Jun. 42(6):796-803. [Medline]. Drislane FW. Overlap of Encephalopathies and Epileptic Seizures. J Clin Neurophysiol. 2013 Oct. 30(5):468-476. [Medline]. Coppola G, Plouin P, Chiron C, Robain O, Dulac O. Migrating partial seizures in infancy: a malignant disorder with developmental arrest. Epilepsia. 1995 Oct. 36(10):1017-24. [Medline]. A glossary of terms most commonly used by clinical electroencephalographers. Electroencephalogr Clin Neurophysiol. 1974 Nov. 37(5):538-48. [Medline]. Moruzzi G, Magoun HW. Brain stem reticular formation and activation of the EEG. 1949. J Neuropsychiatry Clin Neurosci. 1995 Spring. 7(2):251-67. [Medline]. Holmes GL, Lenck-Santini PP. Role of interictal epileptiform abnormalities in cognitive impairment. Epilepsy Behav. 2006 May. 8(3):504-15. [Medline]. Shewmon DA, Erwin RJ. Transient impairment of visual perception induced by single interictal occipital spikes. J Clin Exp Neuropsychol. 1989 Oct. 11(5):675-91. [Medline]. Shewmon DA, Erwin RJ. The effect of focal interictal spikes on perception and reaction time. II. Neuroanatomic specificity. Electroencephalogr Clin Neurophysiol. 1988 Apr. 69(4):338-52. [Medline]. Kasteleijn-Nolst Trenité DG. Transient cognitive impairment during subclinical epileptiform electroencephalographic discharges. Semin Pediatr Neurol. 1995 Dec. 2(4):246-53. [Medline]. Aarts JH, Binnie CD, Smit AM, Wilkins AJ. Selective cognitive impairment during focal and generalized epileptiform EEG activity. Brain. 1984 Mar. 107 ( Pt 1):293-308. [Medline]. Binnie CD. Cognitive impairment during epileptiform discharges: is it ever justifiable to treat the EEG?. Lancet Neurol. 2003 Dec. 2(12):725-30. [Medline]. Binnie CD. Significance and management of transitory cognitive impairment due to subclinical EEG discharges in children. Brain Dev. 1993 Jan-Feb. 15(1):23-30. [Medline]. Binnie CD, Kasteleijn-Nolst Trenité DG, Smit AM, Wilkins AJ. Interactions of epileptiform EEG discharges and cognition. Epilepsy Res. 1987 Jul. 1(4):239-45. [Medline]. Aldenkamp AP, Overweg J, Gutter T, Beun AM, Diepman L, Mulder OG. Effect of epilepsy, seizures and epileptiform EEG discharges on cognitive function. Acta Neurol Scand. 1996 Apr. 93(4):253-9. [Medline]. Nicolai J, Aldenkamp AP, Arends J, Weber JW, Vles JS. Cognitive and behavioral effects of nocturnal epileptiform discharges in children with benign childhood epilepsy with centrotemporal spikes. Epilepsy Behav. 2006 Feb. 8(1):56-70. [Medline]. Massa R, de Saint-Martin A, Carcangiu R, Rudolf G, Seegmuller C, Kleitz C, et al. EEG criteria predictive of complicated evolution in idiopathic rolandic epilepsy. Neurology. 2001 Sep 25. 57(6):1071-9. [Medline]. Nabbout R, Dulac O. Epileptic encephalopathies: a brief overview. J Clin Neurophysiol. 2003 Nov-Dec. 20(6):393-7. [Medline]. Morrell F. Secondary epileptogenesis in man. Arch Neurol. 1985 Apr. 42(4):318-35. [Medline]. Morrell F, Whisler WW, Smith MC, Hoeppner TJ, de Toledo-Morrell L, Pierre-Louis SJ, et al. Landau-Kleffner syndrome. Treatment with subpial intracortical transection. Brain. 1995 Dec. 118 ( Pt 6):1529-46. [Medline]. Kobayashi K, Murakami N, Yoshinaga H, Enoki H, Ohtsuka Y, Ohtahara S. Nonconvulsive status epilepticus with continuous diffuse spike-and-wave discharges during sleep in childhood. Jpn J Psychiatry Neurol. 1988 Sep. 42(3):509-14. [Medline]. Guzzetta F, Battaglia D, Veredice C, Donvito V, Pane M, Lettori D, et al. Early thalamic injury associated with epilepsy and continuous spike-wave during slow sleep. Epilepsia. 2005 Jun. 46(6):889-900. [Medline]. Sánchez Fernández I, Takeoka M, Tas E, Peters JM, Prabhu SP, Stannard KM, et al. Early thalamic lesions in patients with sleep-potentiated epileptiform activity. Neurology. 2012 May 29. 78 (22):1721-7. [Medline]. Hrachovy RA, Frost JD. Severe Encephalopathic Epilepsy in Infants: Infantile Spasms (West Syndrome). In: Pellock JM, Bourgeois BFD, Dodson WE. Undefined. Pediatric Epilepsy. Third Edition. New York, NY: Demos Medical Publishing; 2008:16. Saitoh M, Shinohara M, Hoshino H, Kubota M, Amemiya K, Takanashi JL, et al. Mutations of the SCN1A gene in acute encephalopathy. Epilepsia. 2012 Feb 6. [Medline].
} Dalla Bernardina B, Fontana E, Darra F. Myoclonic status in non-progressive encephalopathies. International Leauge Against Epilepsy. Available at http://www.ilae.org/ctf/myoclon_stat_nonpro_enceph.html. Accessed: February 15, 2011. Morita DA, Glauser TA. Lennox-Gastaut Syndrome. In: Pellock JM, Bourgeois BFD, Dodson E. Third. Undefined. Pediatric Epilepsy: Diagnosis and Therapy. New York, NY: Demos Medical Publishing; 2008:Chapter 21. Takeoka M, Riviello JJ Jr, Duffy FH, Kim F, Kennedy DN, Makris N, et al. Bilateral volume reduction of the superior temporal areas in Landau-Kleffner syndrome. Neurology. 2004 Oct 12. 63(7):1289-92. [Medline]. Strug LJ, Clarke T, Chiang T, Chien M, Baskurt Z, Li W, et al. Centrotemporal sharp wave EEG trait in rolandic epilepsy maps to Elongator Protein Complex 4 (ELP4). Eur J Hum Genet. 2009 Sep. 17(9):1171-81. [Medline]. [Full Text]. Deonna T, Roulet E. Autistic spectrum disorder: evaluating a possible contributing or causal role of epilepsy. Epilepsia. 2006. 47 Suppl 2:79-82. [Medline]. Kramer U, Nevo Y, Neufeld MY, Fatal A, Leitner Y, Harel S. Epidemiology of epilepsy in childhood: a cohort of 440 consecutive patients. Pediatr Neurol. 1998 Jan. 18(1):46-50. [Medline]. Aicardi J, Ohtahara S. Severe neonatal epilepsies with suppression-burst pattern. In: Roger J, Thomas P, Bureau M, Hirsch D, Dravet C, et al. Undefined. Syndromes in Infancy, Childhood and Adolescence. Fourth Edition. John Libbey Eurotext; 2005:Chapter 3. Hurst DL. Epidemiology of severe myoclonic epilepsy of infancy. Epilepsia. 1990 Jul-Aug. 31(4):397-400. [Medline]. Guerrini R, Parmeggiani L, Bonanni P, Kaminska A, Dulac O. Myoclonic astatic epilepsy. In: Roger J, Bureau M, et al. Undefined. Syndromes in Infancy, Childhood and Adolescence. Fourth Edition. Montrouge, France: John Libbey Eurotext; 2005:Chapter 8. Oguni H, Hayashi K, Imai K, Funatsuka M, Sakauchi M, Shirakawa S, et al. Idiopathic myoclonic-astatic epilepsy of early childhood--nosology based on electrophysiologic and long-term follow-up study of patients. Adv Neurol. 2005. 95:157-74. [Medline]. Weglage J, Demsky A, Pietsch M, Kurlemann G. Neuropsychological, intellectual, and behavioral findings in patients with centrotemporal spikes with and without seizures. Dev Med Child Neurol. 1997 Oct. 39(10):646-51. [Medline]. Staden U, Isaacs E, Boyd SG, Brandl U, Neville BG. Language dysfunction in children with Rolandic epilepsy. Neuropediatrics. 1998 Oct. 29(5):242-8. [Medline]. Nicolai J, van der Linden I, Arends JB, van Mil SG, Weber JW, Vles JS, et al. EEG characteristics related to educational impairments in children with benign childhood epilepsy with centrotemporal spikes. Epilepsia. 2007 Nov. 48(11):2093-100. [Medline]. Saint-Martin AD, Seegmuller C, Carcangiu R, Kleitz C, Hirsch E, Marescaux C, et al. [Cognitive consequences of Rolandic Epilepsy]. Epileptic Disord. 2001. 3 Spec No 2:SI59-65. [Medline]. Metz-Lutz MN, Filippini M. Neuropsychological findings in Rolandic epilepsy and Landau-Kleffner syndrome. Epilepsia. 2006. 47 Suppl 2:71-5. [Medline]. Ohtahara S, Yamatogi Y. Ohtahara syndrome: with special reference to its developmental aspects for differentiating from early myoclonic encephalopathy. Epilepsy Res. 2006 Aug. 70 Suppl 1:S58-67. [Medline]. McKinney W, McGreal DA. An aphasic syndrome in children. Can Med Assoc J. 1974 Mar 16. 110(6):637-9. [Medline]. [Full Text]. Riviello JJ, Hadjiloizou S. The Landau-Kleffner Syndrome and Continuous Spike-Waves during Sleep. In: Pellock JM, Bourgeois BFD, Dodson WE. Pediatric Epilepsy: Diagnosis and Therapy. Third Edition. New York, NY: Demos Medical Publishing; 2008:Chapter 24. Tuchman R, Rapin I. Epilepsy in autism. Lancet Neurol. 2002 Oct. 1(6):352-8. [Medline]. Levisohn PM. The autism-epilepsy connection. Epilepsia. 2007. 48 Suppl 9:33-5. [Medline]. Laufs H. Functional imaging of seizures and epilepsy: evolution from zones to networks. Curr Opin Neurol. 2012 Feb 8. [Medline]. Wong-Kisiel LC, Nickels K. Electroencephalogram of Age-Dependent Epileptic Encephalopathies in Infancy and Early Childhood. Epilepsy Res Treat. 2013. 2013:743203. [Medline]. [Full Text]. Patry G, Lyagoubi S, Tassinari CA. Subclinical "electrical status epilepticus" induced by sleep in children. A clinical and electroencephalographic study of six cases. Arch Neurol. 1971 Mar. 24(3):242-52. [Medline]. Van Hirtum-Das M, Licht EA, Koh S, Wu JY, Shields WD, Sankar R. Children with ESES: variability in the syndrome. Epilepsy Res. 2006 Aug. 70 Suppl 1:S248-58. [Medline]. Smith MC, Hoeppner TJ. Epileptic encephalopathy of late childhood: Landau-Kleffner syndrome and the syndrome of continuous spikes and waves during slow-wave sleep. J Clin Neurophysiol. 2003 Nov-Dec. 20(6):462-72. [Medline]. [Guideline] Hirtz D, Ashwal S, Berg A, Bettis D, Camfield C, Camfield P, et al. Practice parameter: evaluating a first nonfebrile seizure in children: report of the quality standards subcommittee of the American Academy of Neurology, The Child Neurology Society, and The American Epilepsy Society. Neurology. 2000 Sep 12. 55(5):616-23. [Medline]. [Guideline] Karis JP, Seidenwurm DJ, Davis PC, Brunberg JA, De La Paz RL, Dormont PD, et al. ACR Appropriateness Criteria epilepsy. Epilepsy. [Full Text]. Cusmai R, Martinelli D, Moavero R, Dionisi Vici C, Vigevano F, Castana C, et al. Ketogenic diet in early myoclonic encephalopathy due to non ketotic hyperglycinemia. Eur J Paediatr Neurol. 2012 Jan 17. [Medline]. Chiron C, Marchand MC, Tran A, Rey E, d'Athis P, Vincent J, et al. Stiripentol in severe myoclonic epilepsy in infancy: a randomised placebo-controlled syndrome-dedicated trial. STICLO study group. Lancet. 2000 Nov 11. 356(9242):1638-42. [Medline]. Sasagawa M, Kioi Y. [A successful treatment with intravenous high doses of gamma globulin for a minor status in a patient with Doose syndrome]. No To Hattatsu. 1997 May. 29(3):261-3. [Medline]. LANDAU WM, KLEFFNER FR. Syndrome of acquired aphasia with convulsive disorder in children. Neurology. 1957 Aug. 7(8):523-30. [Medline]. Deuel RK, Lenn NJ. Treatment of acquired epileptic aphasia. J Pediatr. 1977 Jun. 90(6):959-61. [Medline]. Aeby A, Poznanski N, Verheulpen D, Wetzburger C, Van Bogaert P. Levetiracetam efficacy in epileptic syndromes with continuous spikes and waves during slow sleep: experience in 12 cases. Epilepsia. 2005 Dec. 46(12):1937-42. [Medline]. De Negri M, Baglietto MG, Battaglia FM, Gaggero R, Pessagno A, Recanati L. Treatment of electrical status epilepticus by short diazepam (DZP) cycles after DZP rectal bolus test. Brain Dev. 1995 Sep-Oct. 17(5):330-3. [Medline]. Hadjiloizou SM, Bourgeois BFD, Duffy FH, et al. Childhood-onset epileptic encephalopathies with sleep activated EEG (EESA_EEG) and high dose diazepam treatment (HDDT): Review of a 5-year experience at Children's Hospital Boston. Undefined. Epilepsia. Suppl. 8; 2005;46:150-151. Marescaux C, Hirsch E, Finck S, Maquet P, Schlumberger E, Sellal F, et al. Landau-Kleffner syndrome: a pharmacologic study of five cases. Epilepsia. 1990 Nov-Dec. 31(6):768-77. [Medline]. Lerman P, Lerman-Sagie T, Kivity S. Effect of early corticosteroid therapy for Landau-Kleffner syndrome. Dev Med Child Neurol. 1991 Mar. 33(3):257-60. [Medline]. Chez MG, Loeffel M, Buchanan CP, et al. Pulse high-dose steroids as combination therapy with valproic acid in epileptic aphasia patients with pervasive developmental delay or autism. Undefined. Ann Neurol. 1998;44(3):539. Tsuru T, Mori M, Mizuguchi M, Momoi MY. Effects of high-dose intravenous corticosteroid therapy in Landau-Kleffner syndrome. Pediatr Neurol. 2000 Feb. 22(2):145-7. [Medline]. Sinclair DB, Snyder TJ. Corticosteroids for the treatment of Landau-kleffner syndrome and continuous spike-wave discharge during sleep. Pediatr Neurol. 2005 May. 32(5):300-6. [Medline]. Dagar A, Chandra PS, Chaudhary K, Avnish C, Bal CS, Gaikwad S, et al. Epilepsy Surgery in a Pediatric Population: A Retrospective Study of 129 Children from a Tertiary Care Hospital in a Developing Country along with Assessment of Quality of Life. Pediatr Neurosurg. 2011. 47(3):186-93. [Medline]. Morrell F, Whisler WW, Bleck TP. Multiple subpial transection: a new approach to the surgical treatment of focal epilepsy. J Neurosurg. 1989 Feb. 70(2):231-9. [Medline]. Grote CL, Van Slyke P, Hoeppner JA. Language outcome following multiple subpial transection for Landau-Kleffner syndrome. Brain. 1999 Mar. 122 ( Pt 3):561-6. [Medline]. Irwin K, Birch V, Lees J, Polkey C, Alarcon G, Binnie C, et al. Multiple subpial transection in Landau-Kleffner syndrome. Dev Med Child Neurol. 2001 Apr. 43(4):248-52. [Medline]. 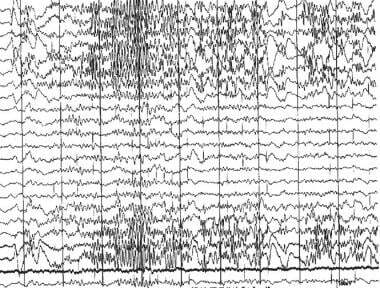 EEG of a patient with Landau-Kleffner syndrome showing electrical status epilepticus of sleep (ESES). Epileptic and epileptiform encephalopathies. Waking EEG in Landau-Kleffner syndrome, showing left posterior spikes. Epileptic and epileptiform encephalopathies. EEG in Landau-Kleffner syndrome (LKS), before and after treatment with prednisone. The left EEG tracing shows electrical status epilepticus of sleep. The right tracing, obtained after 6 months of prednisone treatment, is normal. Epileptic and epileptiform encephalopathies. Frequency-modulated auditory evoked response (FMAER), before and after treatment with prednisone. The left FMAER is absent. The right FMAER is normal following treatment. Disclosure: GXC Global, Inc. Intellectual property rights Medical Director - company is to develop a seizure detecting device.